The chronology of ‘Hacked to Death’ in Bangladesh has raised alarm in the country and abroad as well. There is little clarity on who is behind these killing. More than 60 people including secular writers and bloggers, professors, members of religious minorities and two foreigners – have been killed in attacks blamed on Islamist militants since 2013. This chronological killing is started since 2004 attacked on Dhaka University teacher Prof Humayun Azad. Now it is vastly creating an alarming situation to move freely out of home. The hacked to death by machetes is a common news in Bangladesh. Every day such type of killing is occurred. Chronology of killing is raised since 2013. The murders of two foreigners – an Italian and a Japanese man – last October, added a new dimension and more security questions. In many of the attacks, victims have been hacked to death with machetes, and in some cases beheaded. Now, the question is rising-Is these killings violence escalating? It appears so. Initially, secular and atheist bloggers and writers were targeted. But now the militants seem to be widening their list of targets. The killing of Bloggers, Hindu priest, Teaches and minority proven that militants are broaden their list. But every killing is not linked to militants attack. This match killing could rise due to the individual foe before more days or recent quarrel. But so-called Islamic States, Al Qaeda-linked groups or other militants organization are claimed of killings due to the escalation of fear according to the criminology Studies. Who is behind these killing? It is now a dark question for all including police or low enforcement agencies. Every killing has been claimed by any militants abroad or regional such Islamic state or Ansar al-Islam. But the Bangladeshi government blamed opposition parties, but can’t prove any involvement of them. Security analysts warned that the government could lose the people’s trust if it does not act quickly to curb the attacks. The chronology of killing in Bangladesh is alarming threat for securing life or the fear of going out of home. What is the tendency of this killing by rouge person? There are such types of cause, like old enmity individual to individual, Hurting religious sentiments and some dissident attacks. It is very interesting that every killing is being occurred by hacked to death with machete. Now ‘Hacked to Death’ is a common phenomenon. This is the style of every killing now. These barbaric killing could be happened due to individual enmity using ‘hacked to death’ style. None that why every killing be happened this same style? After the heinous killing, police and low enforcement agencies can’t arrest proper killer. On the other hand, government is raising their finger on opposition party. The killing of Xulhaz Mannan, an activist who also worked for the U.S. Agency for International Development, and his friend, theater actor Tanay Majumder, two were killed because they were pioneers of practicing and promoting homosexuality in Bangladesh and were working day and night to promote homosexuality… with the help of their masters, the U.S. crusaders and its Indian allies. But the Prime Minister Sheikh Hasina said, “The BNP-Jamaat clique has been involved in such secret and heinous murders to destabilize the country”. The opposition denies the allegations, saying they are being scapegoat for Hasina’s failure to maintain security and placate the country’s desire for Islamic rule. However, the claiming by IS, Al-Quada or their militant groups is another interesting things. They are trying escalation their presence in Bangladesh, basically Indian Continent. Due to the reason, they claimed responsibility of killing after happening through statement. The alarming situation for Bangladesh has gone more serious that has risen to handle these cases with special tribunals. It has to be dealt with more seriously and with a clearer and quicker process. … There has been a lack of confidence among people about the investigation and justice system. Government must fix these issues immediately. One of the peculiarities of the killings in Bangladesh is that none has been claimed by a local operation. There have been no demands or ultimatums, or any explanation for why victims were targeted. That remains murky – Bangladesh has myriad extremist groups. The government has disputed claims by so-called Islamic State (IS) or Ansar-Al Islam, the Bangladeshi branch of al-Qaida on the Indian subcontinent, or AQIS for the attacks, instead often blaming opposition parties or local Islamist groups it accuses of seeking to destabilize the country. These claims have been denied by the opposition. After every killing the vacuum has been filled only by statements from Isis and al-Qaida, claiming responsibility for killings thousands of miles from their nearest known base, and made in Arabic, a language not widely spoken in Bangladesh except by religious scholars. A recent Isis propaganda magazine boasted an interview with a man whom they claimed was head of operations in Bangladesh. It is clearly says, it is extremely unlikely that Isis has set up a cell in Bangladesh. It’s physically impossible for an Organization that is Iraq or Syria-based to go somewhere so far away and launch operations. But the consistency and speed of the statements suggest there is an Isis link with killers in Bangladesh, perhaps through a member of the Diasporas, turning the attacks into a propaganda tool for both parties. For local organizations, even a basic link-up with Isis brings extra publicity and possibly recruits, as well as the potential of hard cash. Such a connection may be deepened if the government cannot stop the attacks, as local groups gain a reputation and improve their operational skills. This new development will worry the Bangladeshi government. The terror network that has been killing bloggers since 2013 can be broken up, and the killers brought to justice. More than a dozen suspects are already in police custody. But if sectarian hatred is allowed to take root, then it can take on a life of its own. Any link-up between local extremist groups and IS could also see the pattern of violence becoming even more bloody. The government of Prime Minister Sheikh Hasina continues to deny the existence of IS in Bangladesh, preferring to blame home-grown jihadist groups such as the Jamiatul Mujahideen Bangladesh or JMB for the attacks. The JMB achieved notoriety in the early years of this century through public lynching of left-wing militants and assassinations of judges. Eleven years ago they shocked the country by near-simultaneous bomb attacks in all of the country’s 64 districts. Its top two leaders were arrested soon afterwards and hanged in 2008. Since many of the JMB militants are alleged to be former activists of Bangladesh’s biggest Islamist party, the Jamaat-e-Islam, the government believes all the attacks are their handiwork, claimed under different names and designed to destabilize Bangladesh. But this claim is basically a ridiculous and false allegation on Jamaat. Police and other security team could not prove that guilty on Jamaat. When someone killing in Bangladesh, police of law enforcement agencies bame Jamaat or Shibir. For three years they tried to force the government to change course through violent due to ralesed their top leader alleged and convicted on charges of crimes against humanity committed during the country’s independence war in 1971. As a result, the government’s denial of IS’s presence in Bangladesh and claims of Jamaat of opposition party links to the killings are often greeted with skepticism. Bui this claim is strongly denied by Jamaat and opposition party. Four secular bloggers were hacked to death in Bangladesh last year, with each murder putting the spotlight on the government. In October attackers attempted to slit the throat of a Christian pastor in Bangladesh’s northern region. Police arrested five members of a banned Islamist group, Jamaat-ul Mujahideen, for the attempted murder. And a religious instructor in the Sufi strand of Islam – also known as a pir – was slaughtered at his home in Dhaka. But despite the lengthening list of victims the police have made little progress relating to the investigations. 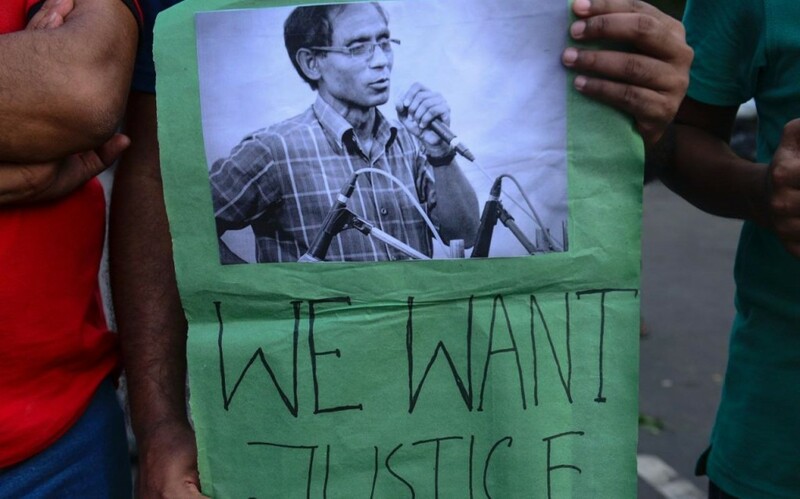 In only one case – the murder of blogger Ahmed Rajib Haider in 2013 – has anyone been convicted? But no one has been punished for the other killings. In fact in many cases the police have been unable to identify the culprits. For instance, it has been more than a year since writer Avijit Roy was hacked to death. But no one has been convicted. Many analysts believe the police are not taking the investigation seriously because of Ms Hasina’s comments, which include criticism of the atheist bloggers. Recent police has raid to arrest militants of culprits involving heinous killing after the killing of Police Super Babul Aktar’s wife Mahmuda Akter. She was stabbed and then shot dead. Authorities in Bangladesh have arrested nearly 150 suspected militants and more than 11,000 others as part of a crackdown on extremism after a wave of brutal killings through four days of raids. Police said they detained 145 suspected militants and that the rest were accused of everything from theft and drug dealing to violence. The statement of police about arrest is also a ridiculous, to arrest of only 145 militants, to be arrest another 11,000 innocent people. It is suspected that majority of them are innocent people not relating such kind of killing. Here are more interesting news that a militant namely Golam Faizullah Fahim was arrested during the killing of Hindu Teacher. Fahim caught by locals after attacking Ripon Chakrabarty, a Hindu mathematics teacher at Government Nazimuddin College in Madaripur. The incident happened just one day after a Madaripur court placed Fahim on a ten-day remand over the attack. But he has been killed in a ‘gunfight’ with police just after one day. Which type of information police get from Fahim? Why has Fahim Killed by the drama of ‘gunfight’? These types of question are raised by intellectual level, but there are no answers. 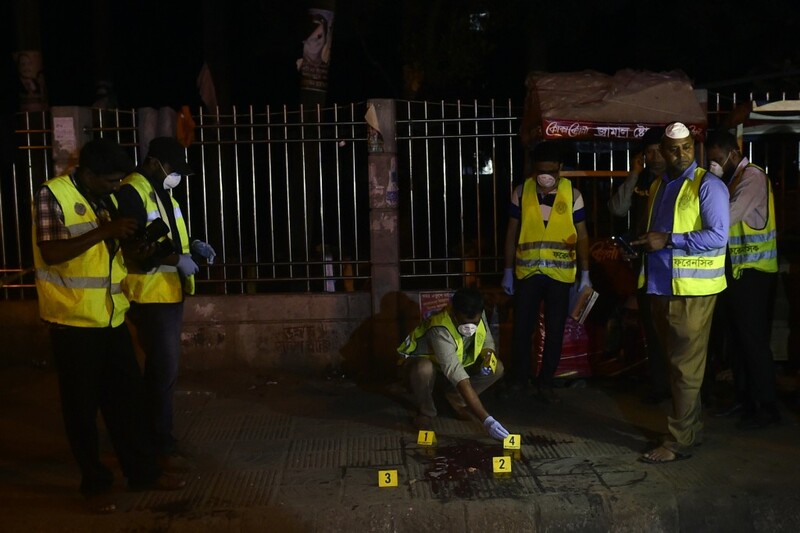 Another top leader of banned militant outfit Ansarullah Bangla Team who took part in the fatal attack on secular writer Avijit Roy was killed in a “gunfight” with the Detective Branch of police in Khilgaon area of Dhaka 19 June. Police introduced Shariful alias Shakib alias Sharif alias Saleh alias Arif alias Hadi as a military and IT trainer of Ansarullah while announcing a Tk.5 lakh bounty for information on his whereabouts on May 19. But after one day, it is proven that he is not Hadi during the delivery his dead body. His Cousin Rahmat Ali and Brother-in-law said he is Mukul Rana not Hadi after showing national Identity Card. How could be proven by this ‘Gun Fight’ Killing? Chronicle killing by militants and gun fight killing by police- through two type of killing what form of definition emerged? June 10, 2016: A volunteer of a Hindu monastery Nityaranjan Pandey, 60, was hacked to death at Sree Sree Thakur Anukulchandra Satsang ashram in Pabna Sadar upazila by ISIS. June 7, 2016: Jhenidah Hindu priest Anando Gopal Ganguly, 70, was hacked to death by ISIS. June 5, 2016: Police superintendent wife Mahmuda Khanam Mitu, 32, was hacked to death in Chittagong. And Shunil Gomez, 60, a Christian businessman was killed in Natore. May 24, 2016: A Hindu businessman Debesh Chandra Pramanik was hacked todeath at his shoe store at Gobindaganj upazila in Gaibandha.ISIS took the responsibility. 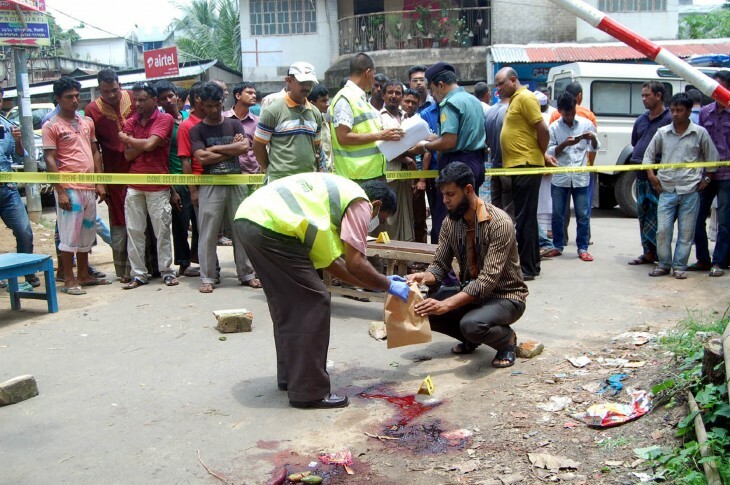 May 20, 2016: A homeopath Sanaur Rahman, 60, has been hacked to death and his friend seriously injured in Kushtia. This attack came six days after an elderly Buddhist monk was hacked to death inside a temple in the hilly district of Bandarban. 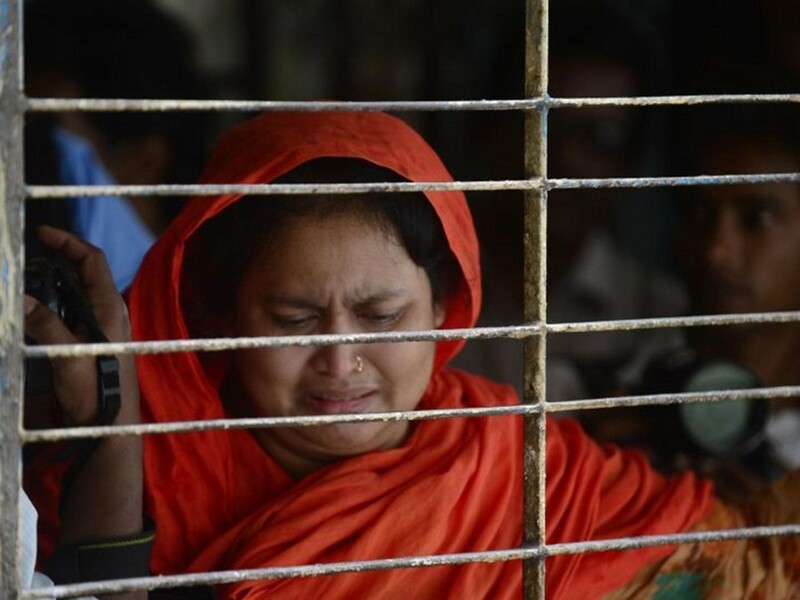 May 14, 2016: An elderly Buddhist monk was found hacked to death on Saturday in Bangladesh, police said, the latest in a spate of murders of religious minorities and secular activists in the Muslim-majority nation. May 7, 2016: 65 years old Pir (Spiritual Leader) Md. Shadidullah has been hacked to death at Tanor Upazila in Rajshahi. “It seems he was hacked first and then slaughtered’’ said: Abdur Razzak, officer-in-charge of Tanor Police Station. April 25, 2016: Editor of LGBT magazine ‘Roopban’, Xulhaz Mannan and his friend Mahbub Tonmoy were hacked to dead at Dhaka. Allahu Akbar” word was used when killers run away. Ansar-al-Islam claimed this responsibility. April 23, 2016: English department teacher of Rajshahi University Prof AFM Rezaul Karim Siddiquee was attacked from the rear while he was waiting for the university bus this morning. Islamic terrorist group ISIS accepted this responsibility. Apr 8, 2016:Sylhet’s Ganajagaran Mancha activist and Jagannath University student Nazimuddin Samad, who was vocal online against religious extremism, is hacked to death in Dhaka’s Sutrapur. January 7, 2016: Homeopathic doctor Chhamir Uddin Mandal killed at Belekhal Bazar of Jhenidah; by JMB/IS. 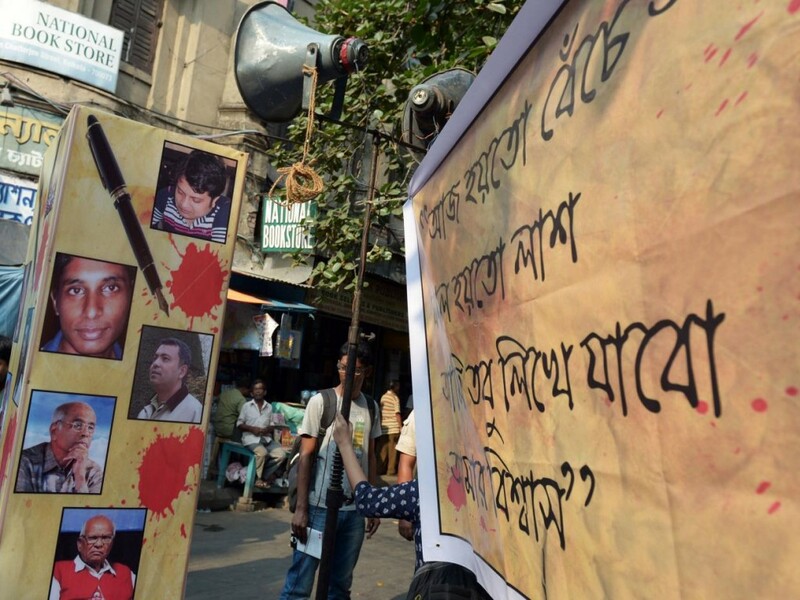 Feb 26, 2015:Machete-brandishing miscreants murder secular writer and blogger Avijit Roy and injure his wife near TSC at DU when the couple was returning home from Amar Ekushey Book Fair. Apr 30, 2015:Online activist Oyasiqur Rahman Babu is hacked to death in broad daylight in the street near his home at Tejgaon. May 12, 2015:Ganajagaran Mancha activist and secular blogger Ananta Bijoy Das is killed in similar fashion in Sylhet. Aug 7, 2015:Another Mancha activist and blogger Niladri Chatterjee Niloy is hacked to death inside his home at East Gorhan. August 9, 2015: Teacher Manab Chandra Roy was hacked to death in Nilfamari by JMB. Sep 28, 2015:Italian aid worker Cesare Tavella is shot dead by three motorcycle-borne assailants at Dhaka’s diplomatic zone Gulshan. October 31, 2015: Publisher Faisal Arefin Dipon killed, and Ahmedur Rashid Tutul, Ranadipam Basu and Tareq Rahim injured for printed Avijit Roy’s books come under attack; by Ansar-al-Islam. Oct 3, 2015:Masked assailants gun down Japanese national Kunio Hoshi in Rangpur’s Kaunia.